At a conference in April of 2017 Hugh Roarty went down to Puerto Rico for an annual CARICOOS stake holders meeting. 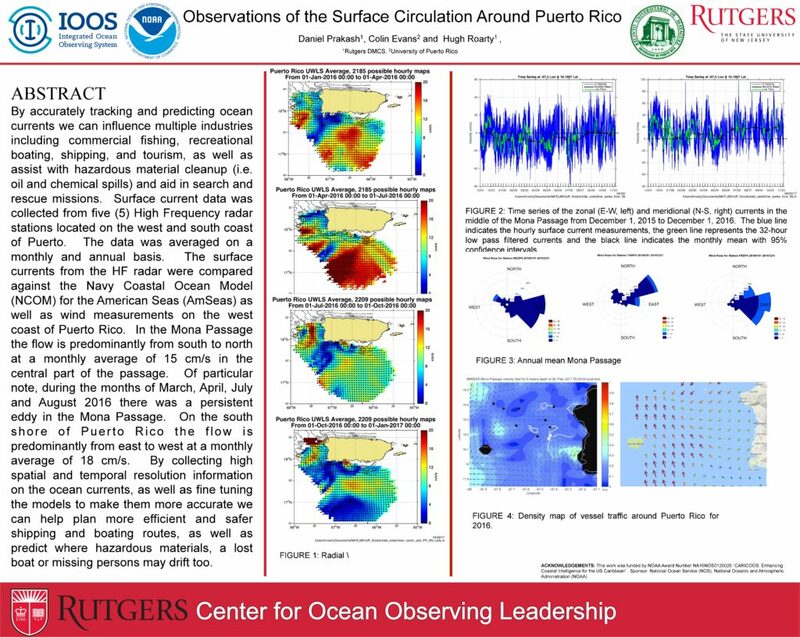 At this meeting the research poster pictured below was presented as a base model for what data Rutgers was studying and why to increase the data collection practices and methods. Sargassum seaweed is an invasive species of microalgae that floats on the ocean surface. Because the seaweed does not sink to the ocean floor its movement is dependent upon ocean currents. It is thought to come from the Sargasso Sea which is estimeated to hold up to 10 million metric tons of Sargassum, but there is still much unkonwn about the seaweed. In recent years there has been a massive influx of the seaweed into the Carribean and it has caused a number of different issues. Most notbaly the seaweed clusters together, washes ashore, and decomposes, adversely affecting the toruism industry. The process for tracking and predicting Sargassum seaweed is still under development but has taken priority due to the record high bloom of the seaweed this year. 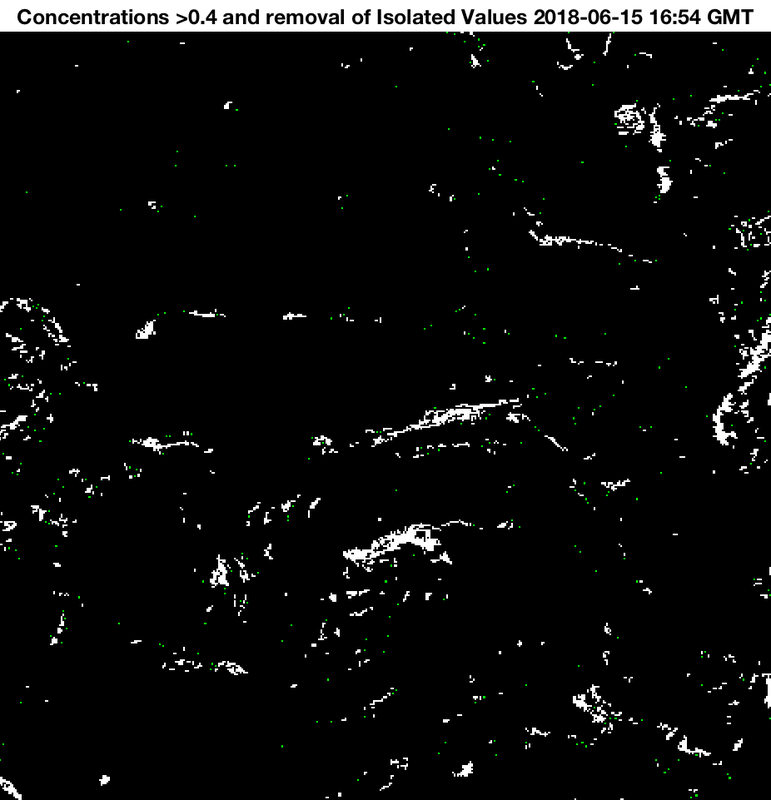 The original process entailed utilizing images of floating algae density maps (Figure 1), provided by the University of Southern Florida’s Optical Oceanography Laboratory, and running these images through an image processing algorithm that identified and clustered the higher concentrations of floating algae. The points with the greatest potential of being Sargassum seaweed were then identified. The latitude and longitude for the centroids of the clusters are used as starting locations for virtual drifter particles. 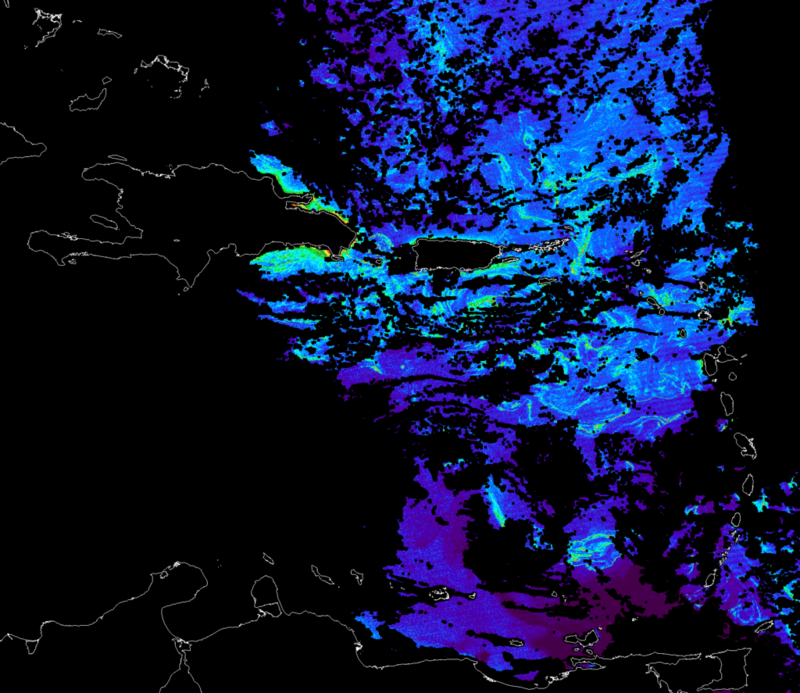 The virtual particles are then advected using the HF Radar network or the AMSEAS model. The images use raw satellite data and USF’s floating algae index (FAI) to identify floating algae and other materials on the ocean surface. The process in its current stage utilizes the Alternate Floating Algae Index (AFAI) via the University of Southern Florida’s Optical Oceanography Laboratory. These data products have better spatial resolution providing more accurate readings. However the AFAI has drawbacks with numerous data gaps due to a number of factors related to the area and the satelites abilities. After the initial figure is loaded into our image processing algorithem the process stays relatively the same, with minor fine tuning, yelding a higher resolution, more accurate product. 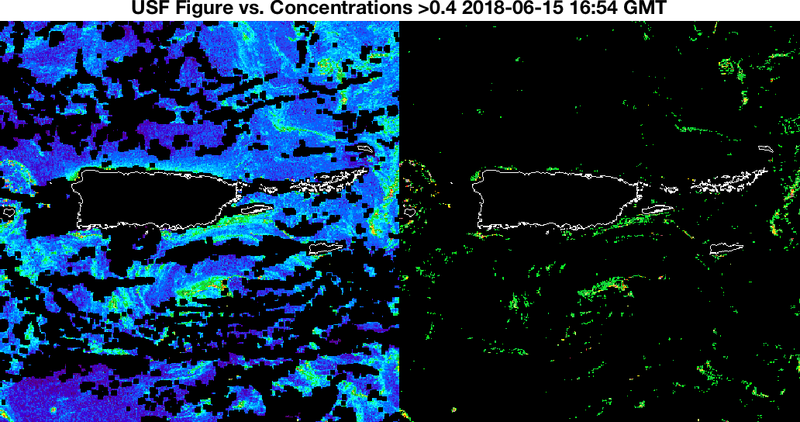 Moving forward we will be incorporating the HF Radar Network in and around Puerto Rico into our system in a more constructive way, as well as creating a warning system to give notice of when Sargassum comes within 5 miles of the coast of selected areas. The warning system will focus around areas established HF Radar stations exist where their data can be utilized in conjunction with different ocean current models. A history of the drifter models for the southern coast of Puerto Rico can be accessed here. 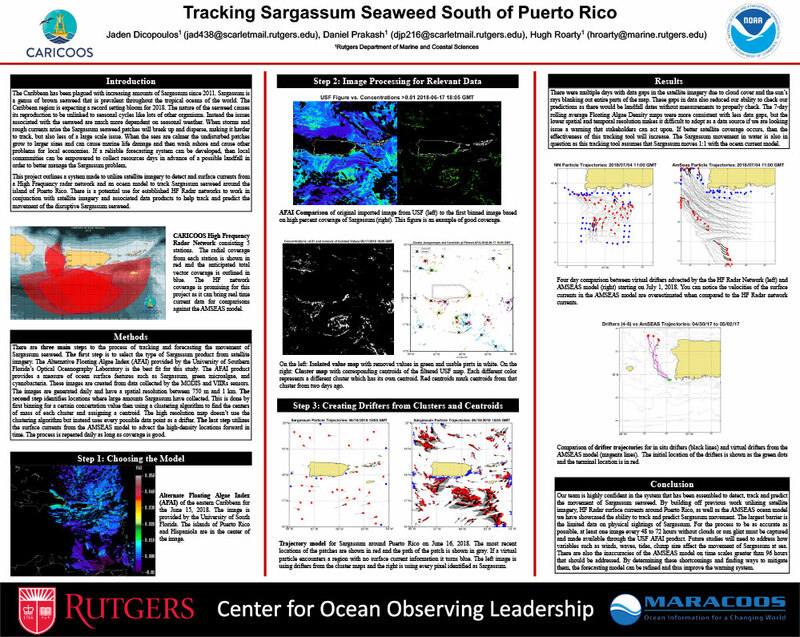 A history of the Sargassum tracking/prediction model of Puerto Rico incorporating the image processing algorithem can be accessed here. 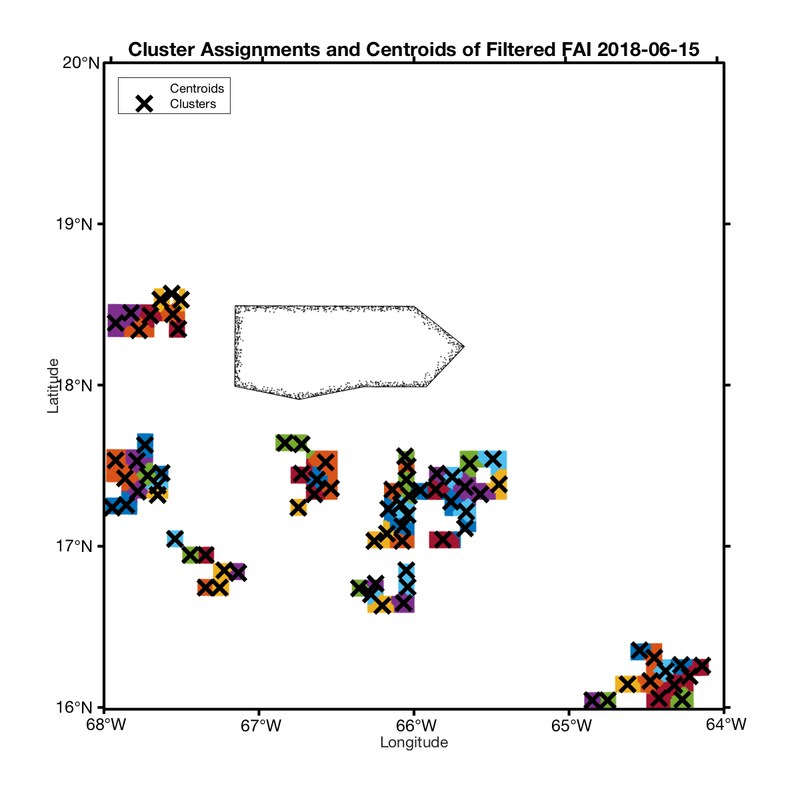 Figure 2C: Alternate Floating Algae Index map (left), map after first set of image processing to determine higher concentration areas of Sargassum (right). 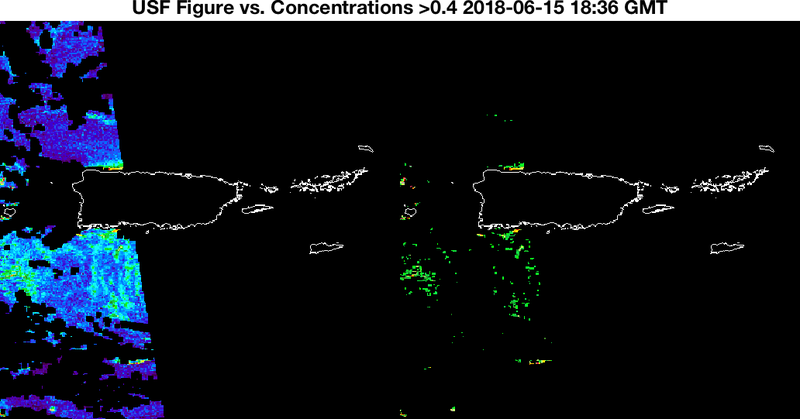 Original image is from (06/15/18 18:36) only two hours from Figure 2B, but shows dramatically different coverage due to satellite coverage. Figure 5A: Virtual drifters animation over a 24 hour period starting on 06/15/18 00:00 GMT. 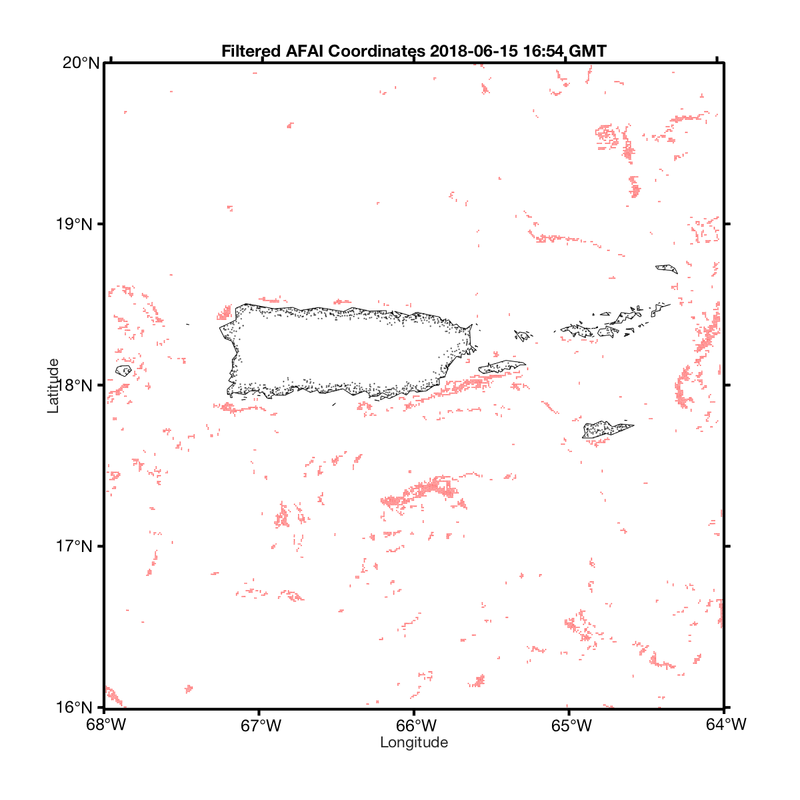 This is a product of analyzing the FAI Density Maps (Figures 1A, 2A, 3A, and 4A) provided by the University of Southern Florida’s Optical Oceanography Laboratory and advecting using the AmSeas ocean model. Figure 5B: High resolution drifters animation over a 48 hour period starting on 06/15/18 16:54 GMT. 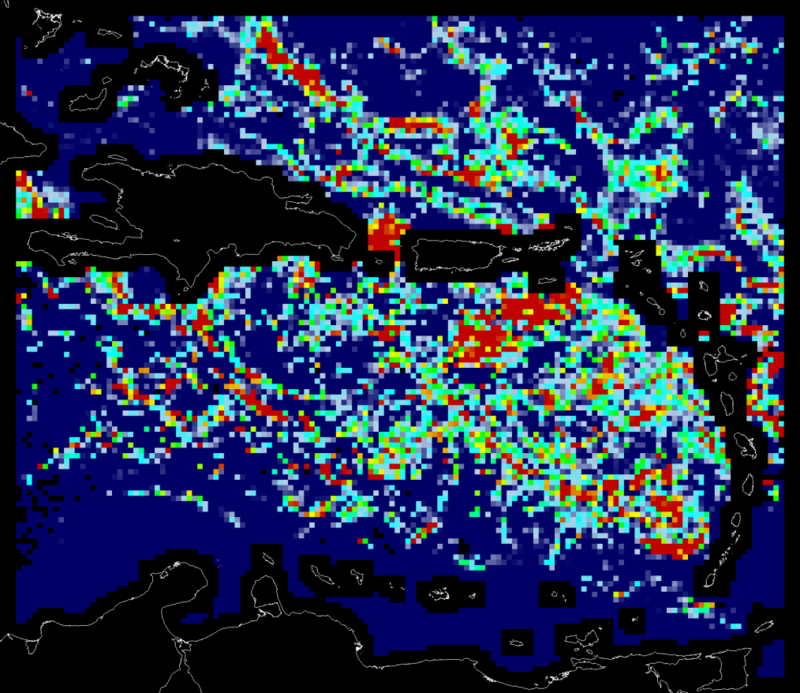 This is a product of analyzing the AFAI Maps (Figures 1B, 2B, 3B, and 4B) provided by the University of Southern Florida’s Optical Oceanography Laboratory and advecting using the AmSeas ocean model. 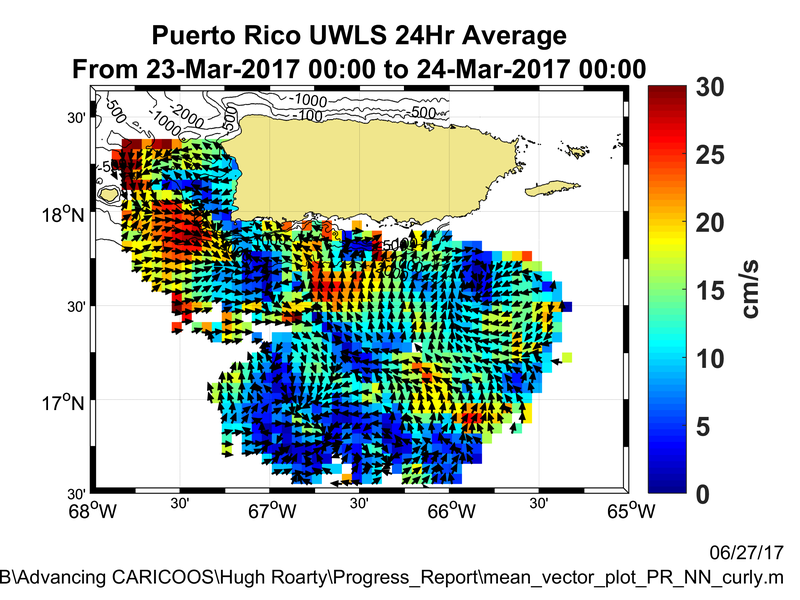 These are daily averages of the 6 km surface currents around Puerto Rico and to analyze the data click here. High-Frequency ⟨HF⟩ radar uses the high-frequency radio waves to track the movement of the ocean surface currents. The phsyics behind HF radar is realitively simple, but the actual task of mapping surface currents witha modern radar sensor is much more complex. By utilizing the Bragg principle/”Bragg-scattering” combined with an observed Doppler-frequency shift, two or more radars observing the same patch of the ocean ,located at different viewing angles, can sum the surface current radial velocity components to produce velocity vectors. Rutgers graduate from the School of Engineering with a B.S. in Applied Sciences in Engineering. Jaden has been a part of the Rutgers University Center for Ocean Observing Leadership research team since the Spring of 2016, originally working as an undergraduate researcher, he is now a Research Engineer. The projects Jaden has worked on include, integrating UAS Lifesaving Operation, Advancing CARICOOS, and Improving CODAR wave measurements. Rutgers undergraduate in the School of Arts and Sciences with a major in Physics, with an option for Ocean Physics. Joseph began working with Dr. Roarty in February 2019 as an undergraduate researcher. 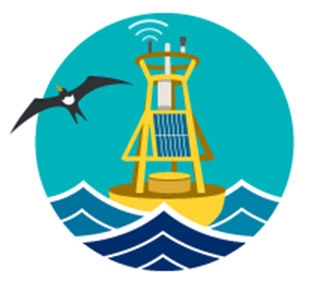 His current project is utilizing HF radar stations and modifying Sargassum seaweed tracking and prediction tools to develop an accurate model for tracking the Sargassum. Rutgers graduate from the School of Engineering with a B.S. in Mechanical Engineering, and a concentration in Energy Systems Engineering. Daniel has worked under Dr. Roarty since January of 2017 as a research intern on the CARICOOS project in different facets. Recently he has been working as a Research Engineer primarily focussing on the design and development of a Sargassum tracking and prediction tool.